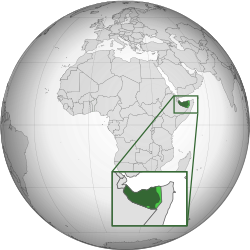 ^ Somalia. World Factbook. Central Intelligence Agency. 14 May 2009 [31 May 2009]. ^ 4.0 4.1 4.2 4.3 4.4 4.5 4.6 索馬利蘭接近获得埃塞俄比亚承认. afrol News. [2007-07-06]. ^ 非盟支持索马里分裂. 邮报和卫报在线. [2007-02-23]. （原始内容存档于2007-09-30）. ^ 沈旭暉. 沈旭暉﹕專訪索馬里蘭外交部長阿都拉希．杜亞里. 亞洲週刊. [2007-04-23]. 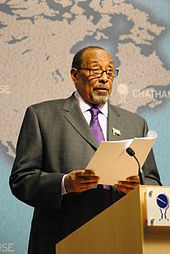 ^ Somalia: The Bo'ame Declaration of Dhulbahante Clan Elders 互联网档案馆的存檔，存档日期2011-12-19. ^ 索馬利蘭共和国档案. Somaliland Official website. [2005-12-02]. （原始内容存档于2012-02-12）. ^ アフリカ21世紀――内戦・越境・隔離の果てに. 日本放送出版協會. 2002: 81. ISBN 4-14-080693-1.